The cell-active anti-aging hair treatment decelerates the aging of the hair follicle, actively combats hair loss and thinning hair and increases hair growth. Today, beautiful, shiny hair is a sign of someone who takes care of themselves and pays attention to beauty and body care. Who doesn’t dream today of amazing, full and shiny hair even when they’re old? To ensure this isn’t just a dream, the La Biosthétique researchers have developed an important formulation. Thérapie Anti-Chute Plus, the cell-active hair treatment to combat hair loss, activates the reformation of stem cells of the hair follicle, extensively protects them and halts aging processes on all levels. Hair loss is effectively combated, hair quality and hair density are significantly improved. - A polyphenol 2 from larch wood reactivates the formation of young stem cells, which are essential for the regeneration of the hair papilla and the new start of the active growth phase. - A microencapsulated phyto cell extract that protects and activates the skin’s own rejuvenating parent cells. - Plant extracts that reduce the hardening of the tissue due to surplus deposition of sugars. - A biologically highly active peptide combined with biotin to improve the energy of the cells combats premature cell death. - Vitamins, minerals, and plant active ingredients ensure optimum nourishment of the hair roots and activate their cell metabolism. After a two-month application, hair growth has increased by 121% and hair loss has decreased by more than 33%. Alone the clinical study on larch wood extract resulted in 9%new hairs and 17% less hair loss after three months of daily treatment. Specifically, this amounts to an increase in hair density by up to 28,000 hairs. 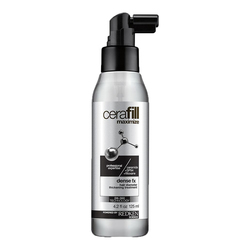 The results are convincing – hair that is full of body and full of life for all ages. Thanks to consistent and innovative La Biosthétique hair care with a medical component, so much is possible. Ideally, you should treat the scalp daily with Thérapie Anti-Chute (preferably over a period of three to four months). Application for prophylaxis and age-related weakening hair growth: If there is a recognisable family tendency to hair loss, we recommend an ongoing preventative treatment with 1-2 ampoules a week. Ideally also in combination with Elixir Anti-Chute. The same goes for age-related weakened hair. • Cleanse hair and scalp with a Dermosthétique shampoo or another La Biosthétique shampoo that is customised to the scalp. • Apply ampoule along the parting of the scalp and before blow-drying lightly massage in with the fingertips or leave in for 20 minutes.